Bank Of Ghana To Put Captain Adam Mahama On The 50 Cedis Note To Honour Him - Agree or Disagree? 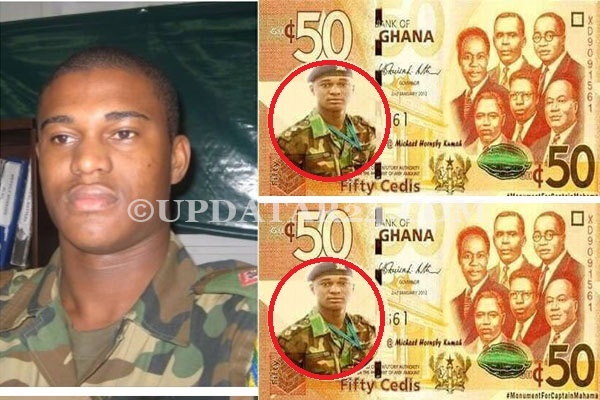 Major Mahama Should Be Placed On The 50 Cedis Note To Honour Him - Agree or Disagree? The sad lynching of Major Mahama has left the entire nation in gloom. As such we're all looking for a way to honor this fallen hero. Already he was given a full state burial which came with Ghs 500,000 from the Trust Fund. A monument will be built in his stead--a lot of people are suggesting that should be situated where the unfortunate incident took place-- Denkyira-Boase. It was also reported that his family want the Tema-Motorway named after him (Major Mahama). Well, what about putting him on the 50 Ghana Cedis note? Gossip Mail: Bank Of Ghana To Put Captain Adam Mahama On The 50 Cedis Note To Honour Him - Agree or Disagree?